Our Response to Trayvon Martin's Killing, Organizing for Civil and Human Rights - RESPECT MY VOTE! 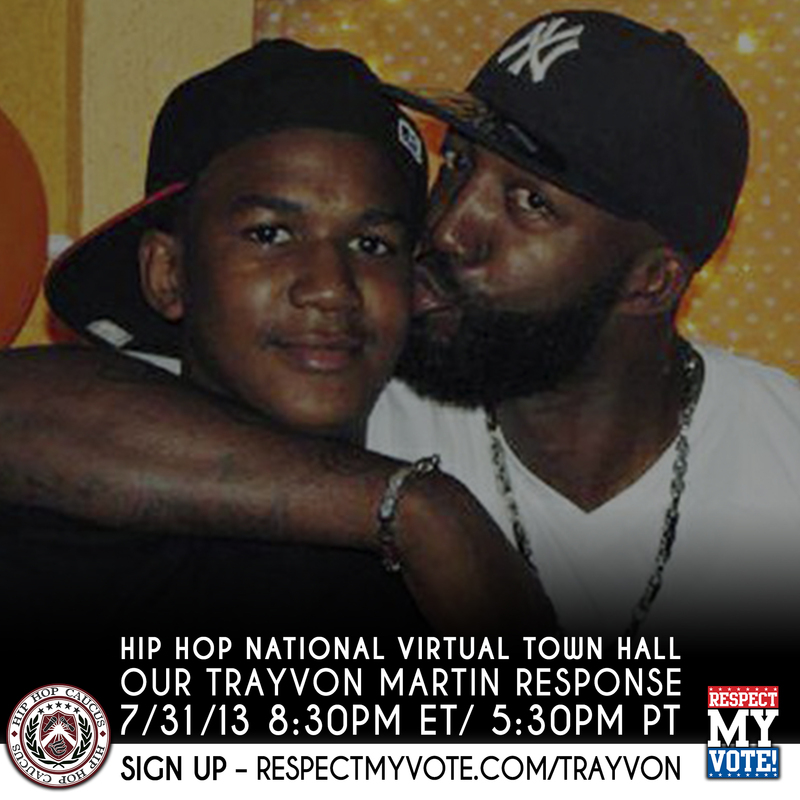 The date has passed for our National Virtual Town Hall to discuss our long-term Trayvon Martin response, post Zimmerman verdict. It was a very powerful Town Hall event, with nearly 1,800 people from around the country participating via phone. Sybrina Fulton, mother of Trayvon Martin, Uncle Bobby, uncle of Oscar Grant, and a number of phenomenal and diverse Hip Hop generation leaders spoke during the Town Hall. Please check out the recap of the Town Hall, including audio of the full Town Hall, and audio clips of each speaker. You can also check out the event Media Advisory. After the acquittal of George Zimmerman, we cried for the deep injustice we witnessed. Now, in the days following the verdict, we are out in the streets, demonstrating, marching, chanting, sharing the experience publicly, and making sure the rest of the country and the world sees that we will not be silent. Although the marching in the streets, by necessity of the demands of our daily lives, will die down, our resolve to fulfill the promises we have made to fight for justice for Trayvon Martin and all the young lives we have lost to gun violence, racial profiling, and police violence, wont. 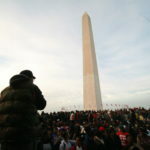 The Hip Hop Caucus’ grassroots and national leadership has put forth a long-term organizing plan, honoring our collective promise to continue to the fight for justice, and for civil and human rights in the 21st century. Below is the outline for that plan. Register for the July 31st Town Hall to discuss it in more detail. In coalition with our civil rights partners, we are calling for the Department of Justice to open a Civil Rights case against George Zimmerman, for racially profiling, stocking, and taking the life of Trayvon Martin. We are weighing in with Attorney General Eric Holder. A number of our partners are circulating online petitions to the Department of Justice, including the NAACP and Color of Change. We don’t want to duplicate efforts, so we encourage you to sign one of these petitions. August 28th is the 50th anniversary of the March on Washington. This will be just six weeks after the Zimmerman Verdict, and we will mobilize for this historic anniversary, lifting up the memory of Trayvon Martin by calling for justice. On Saturday, August 24th, we are organizing a major march on the National Mall in Washington, DC, with our partners in the civil rights movement. We encourage you to join us in DC. On Wednesday, August 28th, the official anniversary, we are asking folks around the country to host “Freedom Parties” in their cities to bring people together locally to discuss what our movement for civil and human rights needs to look like for the next 50 years. Get involved in these mobilizations here. Join with the Trayvon Martin Foundation, which was established by Sybrina Fulton and Tracy Martin in March 2012, to create awareness of how violent crime impacts the families of the victims, and to provide support and advocacy for those families. The scope of the Foundation’s mission is to advocate that crime victims and their families not be ignored in the discussions about violent crime, to increase public awareness of all forms of racial, ethnic and gender profiling, educate youth on conflict resolution techniques, and to reduce the incidences where confrontations between strangers turn deadly. Get involved with the Trayvon Martin Foundation here. Since Tuesday, July 16, young people under the leadership of the Dream Defenders, have been conducting a sit-in of Gov. Rick Scott’s office in the Florida State Capitol. The Dream Defenders are calling on the Governor to convene a special session of the legislature to enact the Trayvon’s Law to repeal Stand Your Ground, ban racial profiling, and end the school-to-prison pipeline in Florida. Get involved with the Dream Defenders movement here. We will hold our elected officials accountable to our justice agenda. 2014 marks mid-term elections, where Members of the U.S. Congress and Senate are up for re-election, state legislators are up for re-election, Governors, Mayors and Judges are up for re-election. “Respect My Vote!” our voter registration, education and get-out-the-vote campaign will be in full force and we will need your help. We will be asking the candidates where they stand on racial profiling, gun reform, “Stand Your Ground” Laws, and police brutality, and sharing that information with young voters, so they can make informed decisions at the ballot box. We will also be sharing information about how those in office now have voted on these issues during their time in office. Our communities are dealing with deep hurt, that too often we aren’t able to address or intentionally heal from. Changes in policy, increasing our political power, changing the public narrative about our communities through mobilization, are all critical pieces to creating the possibility of a better future for our children. But at the most basic level, we must heal from the pain of too much loss of life, especially young life, in our communities. We also must work on greater unity among our communities, based on an understanding of our collective history. To this end we are focusing particularly on projects and initiatives that advance healing and unity. Children: Our concern is with our children’s ability to process, understand, and heal from violence in their own communities, which is compounded by participating in the national experience of high-profile cases like that of Trayvon Martin’s killing. Black immigrant communities: We hope to build stronger bridges between African American history and the Black immigrant experience in this country, particularly in places like Miami. The purpose is to share the experiences of those from other countries, and that of the American experience, and to connect the dots between our common histories, to increase our unity.